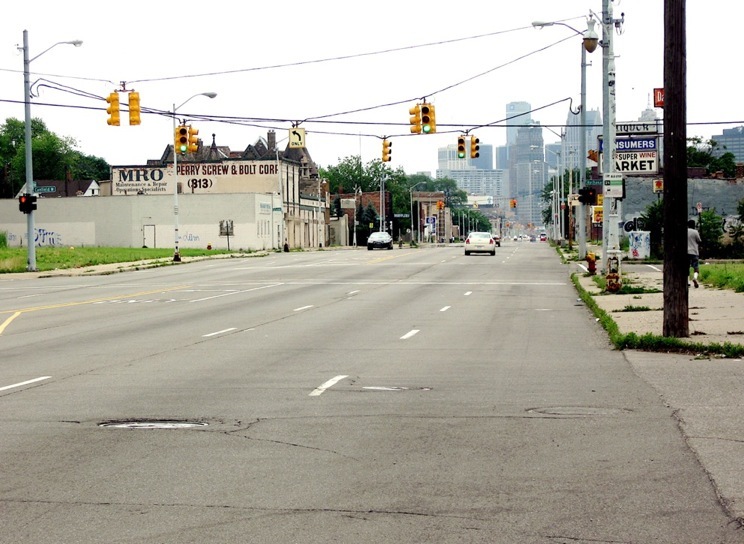 A few weeks ago I wrote about my bicycle journey across McNichols Street (6-mile) from the eastside of Detroit to Linwood Street. At the end of that cross-town ride, I decided to pedal south on Linwood to downtown for my trip home. Linwood from McNichols to Grand River is a little over five-miles in length. It encompasses a cross-section of well-kept residential neighborhoods, a somewhat viable commercial strip and some outstanding early 20th Century commercial architecture. Heading south on Linwood, I immediately entered the Martin Park Community; a well-kept neighborhood of brick homes constructed in various architectural styles. I saw meticulously restored English Tudors, large colonials, a few small ranches and two-family flats with remarkable porches. I cut down a couple of the tree-lined side streets in the community and was surprised at the park-like setting where beautiful, mature trees, created a tunnel of green. A little further south, I crossed Puritan Street and entered the Pilgrim Village community, an area made up of smaller brick and frame homes. The neighborhood felt and looked a little more “urban” to me. I saw dogs chained to a front porch, homes with steel grate security doors, and a few places were boarded up with overgrown lawns. But I was encouraged to see by the well-designed Pilgrim Village Association signs that the neighborhood was organized, and residents seemed to care about their community. As I crossed over the John C Lodge expressway, Linwood changed from residential to mostly commercial. There were the usual fast food outlets, gas stations, convenient stores and a few small manufacturing and storage facilities. 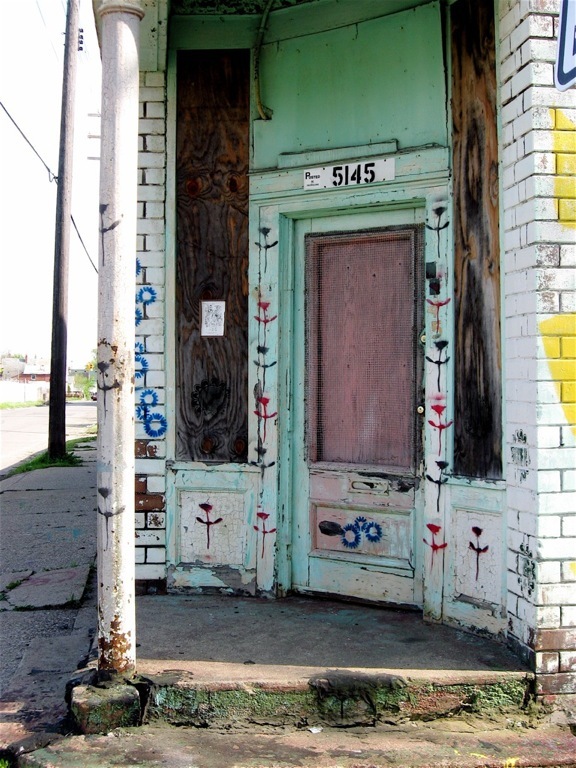 Like many of Detroit’s commercial strips, abandonment was common. In looking at some of the commercial structures, I was struck by some of the Art Deco highlights, brightly painted buildings and unusual businesses like a pest control company that “kills all insects that fly, wiggle or crawl”. At the corner of Linwood and Fenkell Street is a stunning four-story building, home to the Paul Robeson Academy, a Detroit Public School. 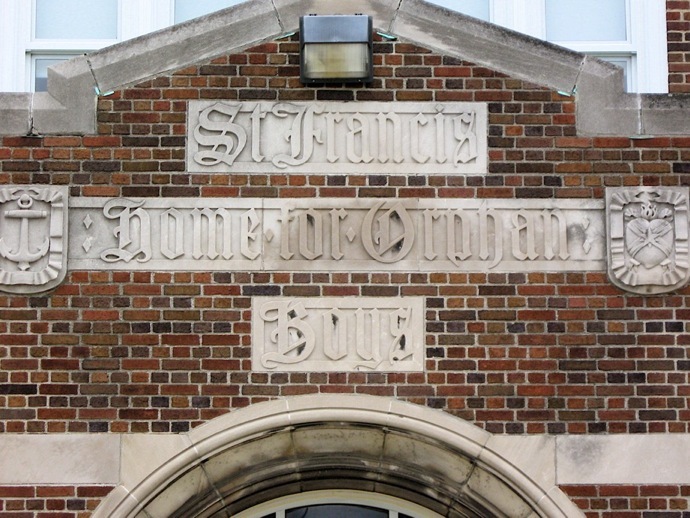 After a brief Internet search, I found that the gorgeous structure was built in 1910 by the Diocese of Detroit, for use as a home for orphan boys. What struck me as I approached the building was its sheer size and country-like setting, similar to a European country estate. I came across a string of large community gardens on Linwood in an area stretching between Oakman Boulevard and Davidson and beyond. Although they weren’t marked, I assumed many of them were somehow affiliated with Focus Hope (located near Oakman), an organization dedicated to improving the surrounding community and the lives of the people living there. Approaching the historic Boston-Edison and LaSalle Gardens neighborhoods, Linwood gradually changed back to residential with a few convenience stores scattered throughout. 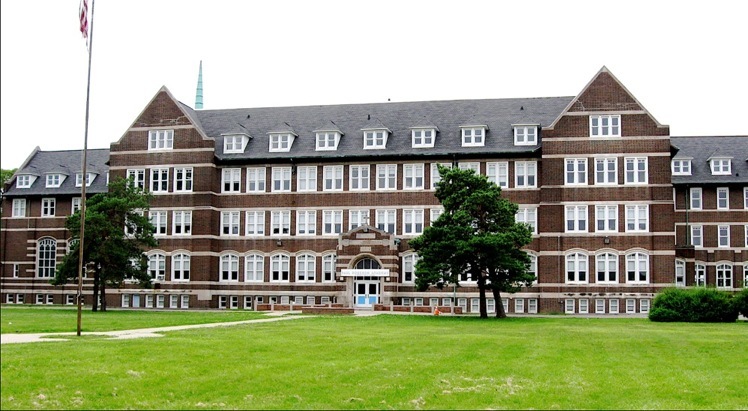 At the corner of Linwood and Chicago Boulevard is the Sacred Heart Major Seminary. 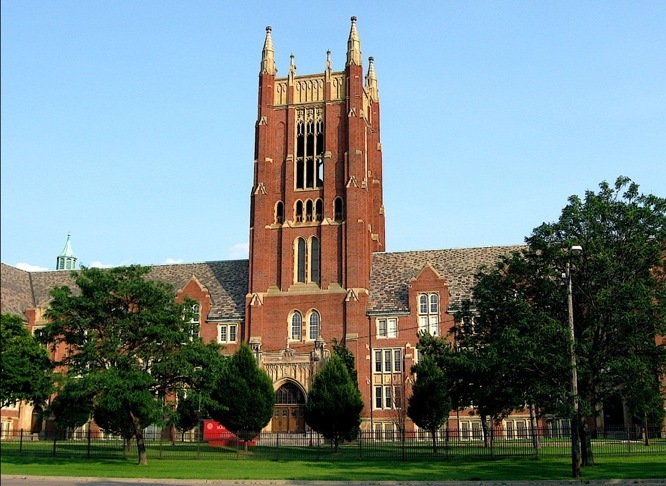 The buildings on their large campus were constructed in the Gothic style, like those found in Oxford, England. 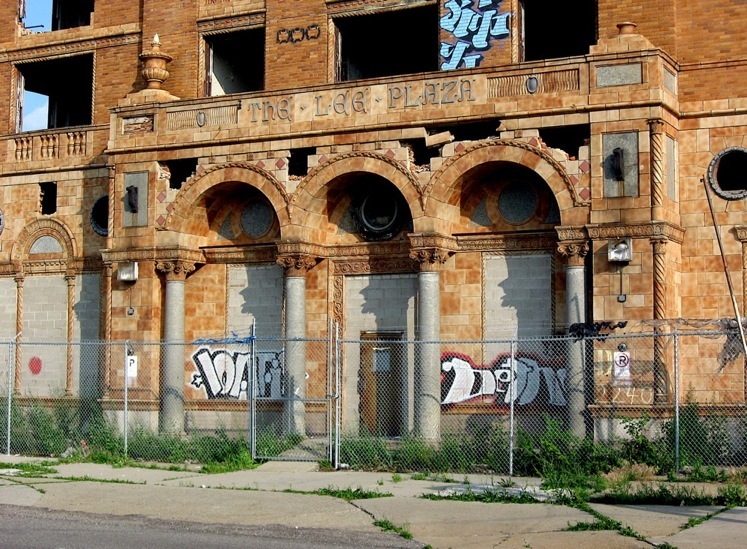 When I reached West Grand Boulevard, I could see one of my favorite Detroit buildings, the long abandoned Lee Plaza Residential Hotel a few blocks to the west. I took a quick detour to check out the once magnificent 17-story Art Deco building that at one time was listed on the National Register of Historic Places. As I rolled up, I could see that some of the original stonework found at the entrance was still in place, and the brick appeared to be solid as far up as I could see. But unfortunately, the building has been ravaged over the years with most, if not all of the original architectural features having been stripped and sold by scavengers. 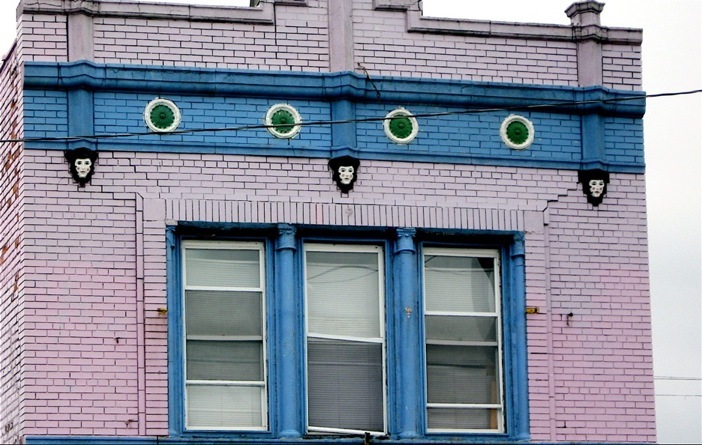 In fact, several years ago, 50 terra-cotta lion heads from the Lee showed up on a Chicago condo development causing an outrage in the preservation community. A few years ago the building was once again in the news because vandals somehow stripped its solid copper roof without being seen. What a shame to see this skeleton of a once magnificent building. Back on southbound Linwood, I crossed over I-94 and the street became quite narrow. 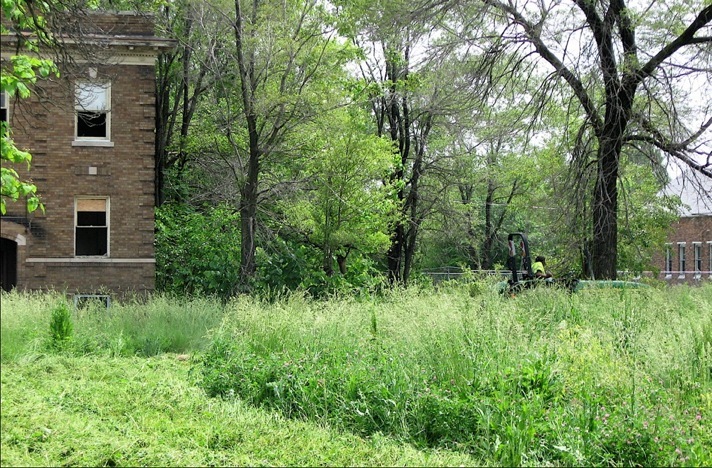 Many empty lots lined the street and several had turned into fields of tall grass like other city neighborhoods. A few blocks further, Linwood jogged right as it approached Grand River where it ended. I took a left on Grand River and headed downtown. I basically had the six-lane road all to myself. 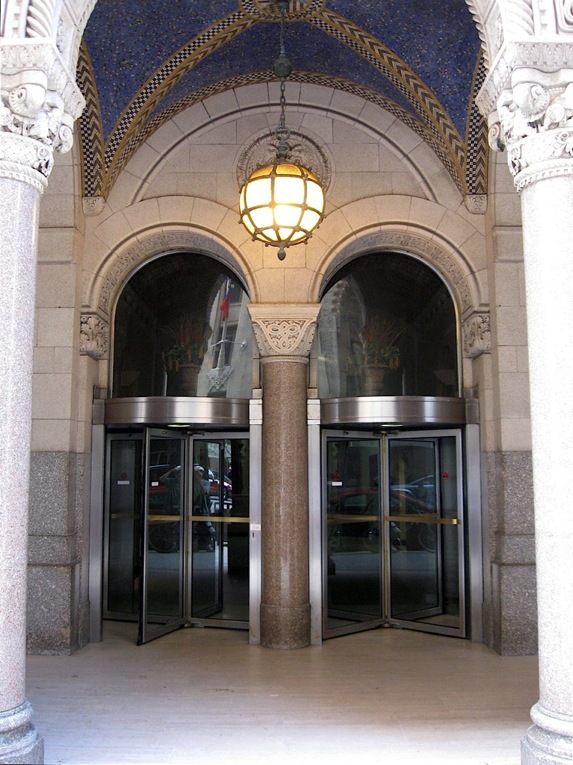 Many of Detroit’s downtown buildings, such as the Guardian, Buhl and Penobscot, have extraordinary entrances built out of marble, granite and other types of stone. Several of the archways and grand pillars feature inlaid Pewabic tile and intricate, carved stonework much like European Cathedrals. Handcrafted lighting fixtures illuminate the space between the sidewalk and brass-trimmed glass doors. Those beautiful, highly polished fixtures highlight the marble or terrazzo floors, leading the way in to the vintage 1920’s structures. In many cases, the doors themselves, whether they revolve or swing, feature spotless, high gloss brass push rails. A few feature intricate Art Deco or other elaborate designs of the period. 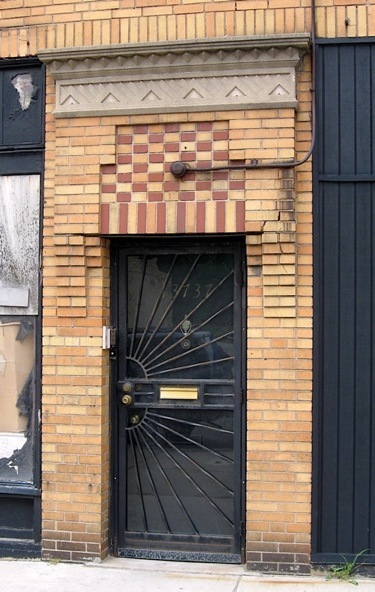 Many of us have seen these amazing entrances downtown, but there are others we pass by and tend to overlook. 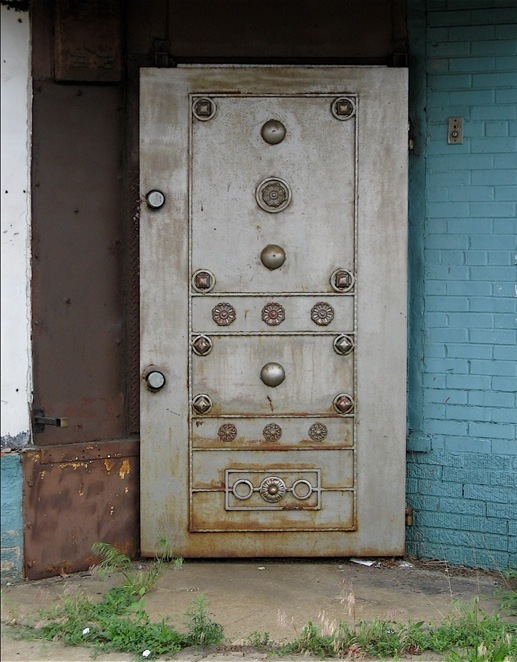 As I bicycle through Detroit’s diverse neighborhoods and once viable commercial strips, I’ve come upon some interesting and unusual doors. 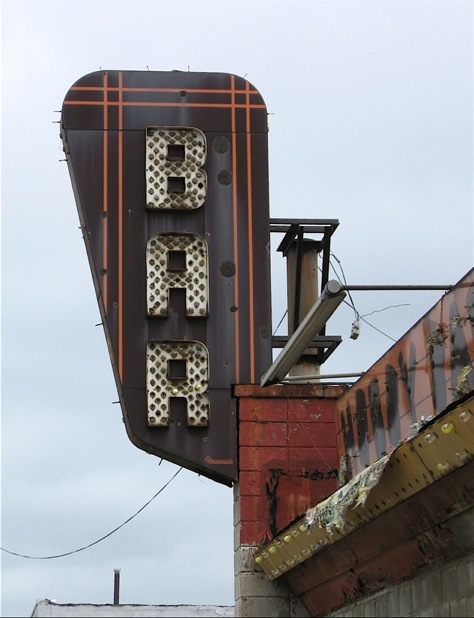 Some are old, weathered and rotted so bad that they are barely hanging in place. Others, such as security doors, are quite the opposite. Constructed of steel and fitted into a jam with less than a sixteenth inch gap anywhere, it would be quite impossible to pry open. A few have two or more locks, reinforced with steel plates and bars. Looking at others, it’s hard to tell how they open. 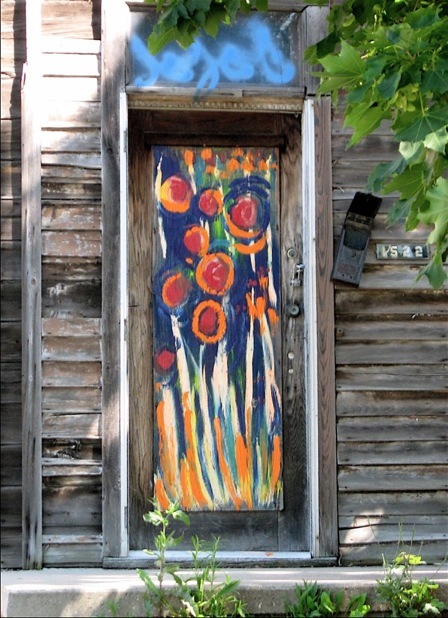 There are many painted doors throughout Detroit as well. Some are quite vivid, offering a stunning contrast to the surrounding wall or jam. 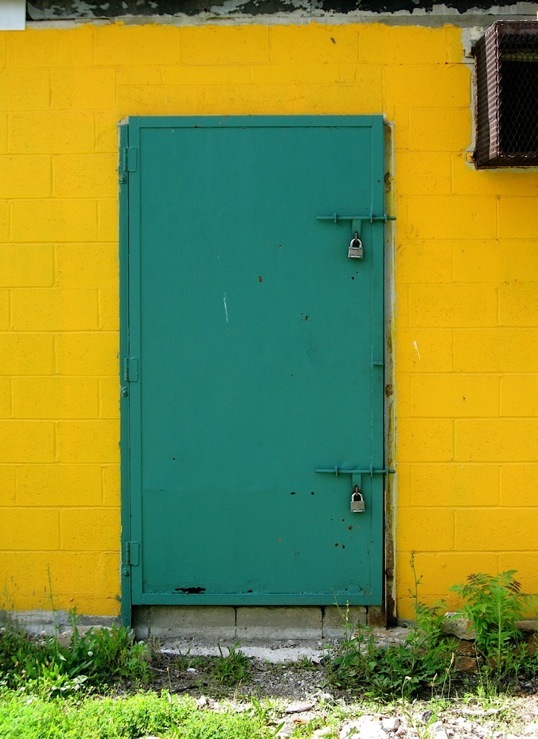 In some cases, I’ve seen where artists have used a door as a “canvas” for their work. 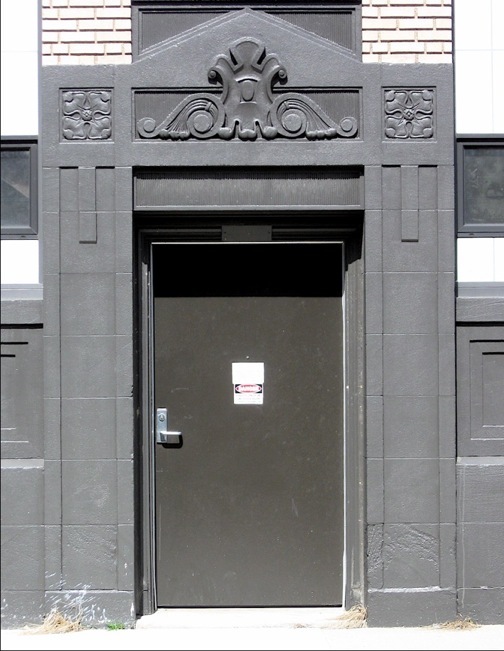 I’ve also spotted what appear to be, one-of-a kind, hand-made custom doors and doors on buildings that seem to be 100-plus years old. 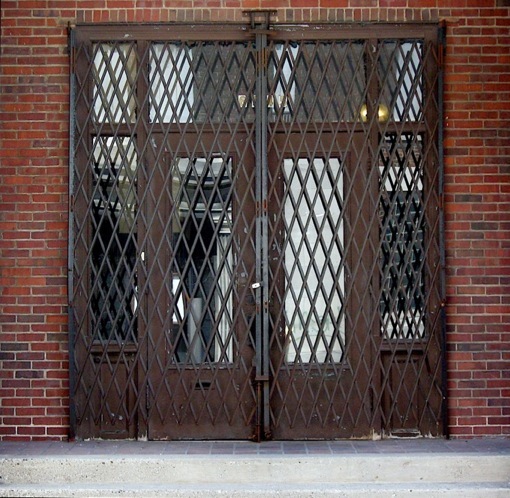 Steel grates and tightly woven mesh covering doors and entrances are quite common. 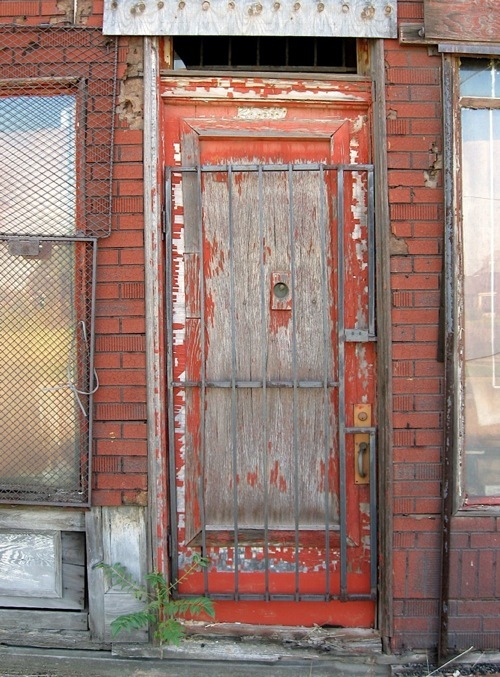 The mixture of doors found in the neighborhoods may not be as ornate and grand as those found on many of the buildings downtown, but they can be quite interesting in their own, unique way. One of the many things I like about bicycling in Detroit is the contrast and diversity found along the endless commercial districts that cross this city. 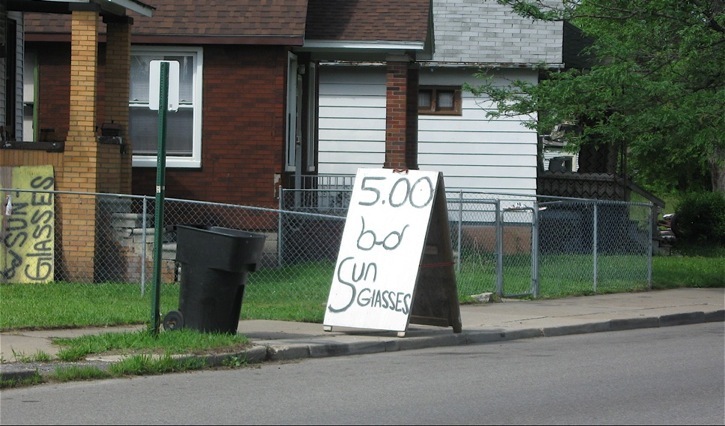 No matter where I end up riding, the range of local entrepreneurial undertakings has always intrigued me. 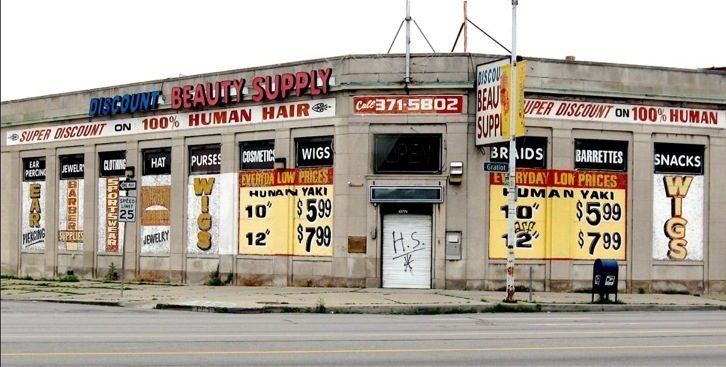 In the midst of the commercial abandonment and blight, I’ve seen viable barber shops; people shopping at discount beauty supply stores; full parking lots at check cashing facilities; and liquor stores with people coming and going. I’ve also ridden past active wheel outlets; car repair facilities where customers are lined up to get in, and Coney Island restaurants where most tables were full. I’ve seen few national chains, with the exceptions of fast food restaurants, dollar stores or an occasional well-known bank or hardware store. 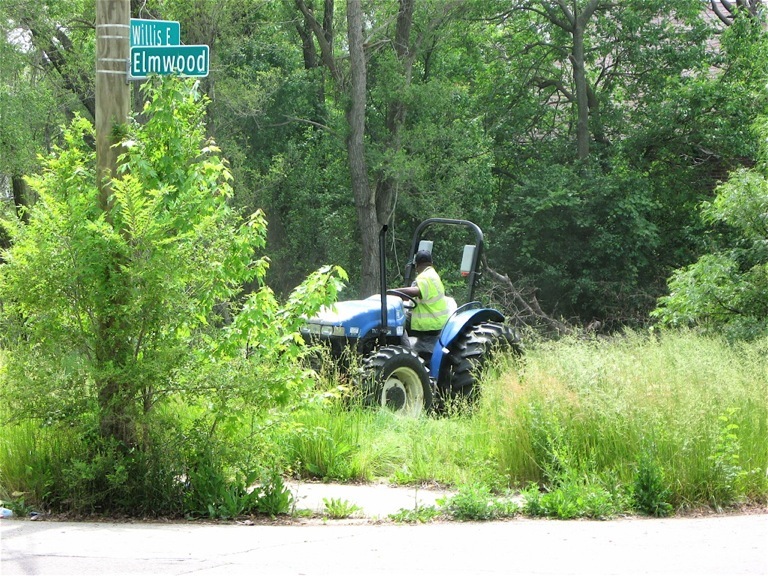 This was quite evident as I rode westbound across McNichols Road (6-mile) to Linwood Street. My ride began at the intersection of Whittier Street and I-94. I rode Whittier north to Chalmers where I took a right to Seymour Street (6-mile), an area where I once lived. 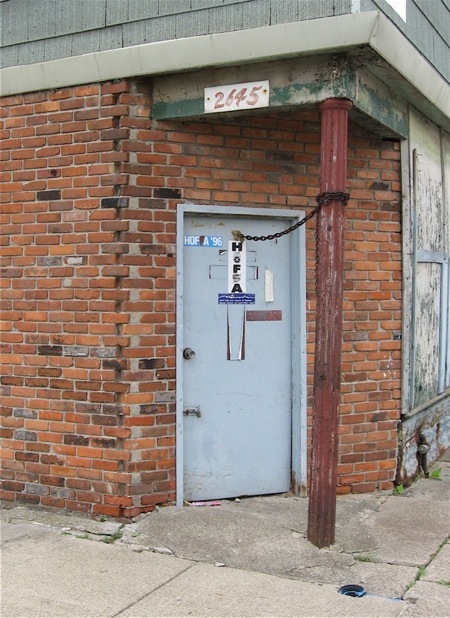 A one-time active commercial strip, this stretch of Chalmers has no retail to speak of and many of the commercial structures are either gone or slated for demolition. At Seymour, I turned left and headed through what’s left of the residential neighborhood to Gratiot Avenue where Seymour turns into McNichols. 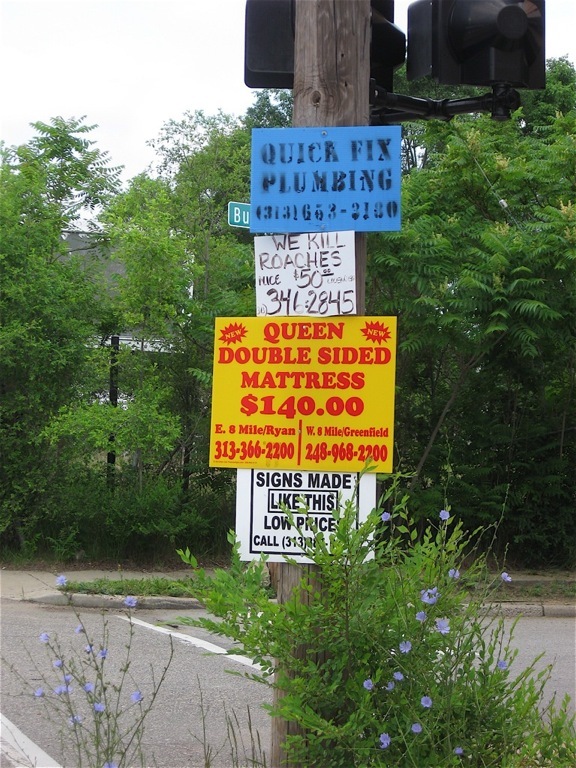 This Gratiot Ave. business offers a variety of products. A few blocks north of Gratiot on McNichols I caught a piece of major eye candy on my left. 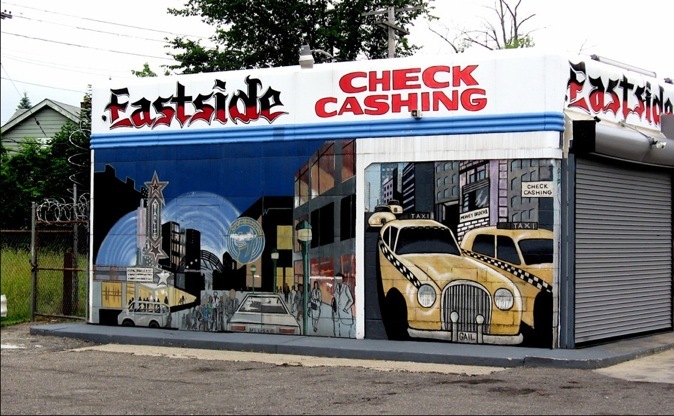 Painted on the sides of a check-cashing store were some of the best urban murals I’ve ever come across. Not only did they promote the business, they also featured some of Detroit’s famous landmarks such as Hudson’s and Eastern Market. Well known people like Joe Louis and Henry Ford are also painted into the scene. An amazing piece of urban art! A beautiful example of urban art. 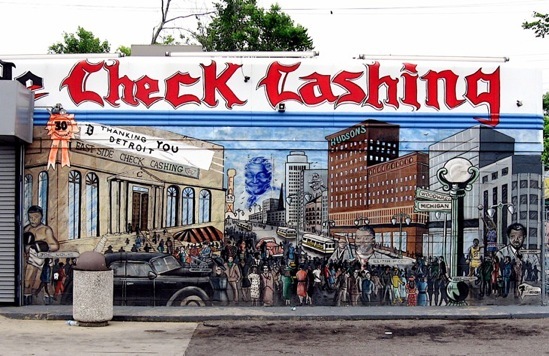 There are many Detroit businesses within this painting. 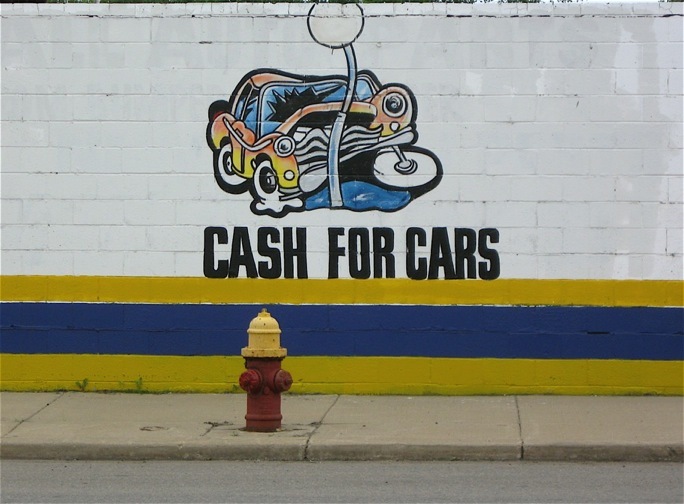 I continued west on McNichols past the usual assortment of auto fix-it shops, car washes, barber shops and storefront churches where members were headed for Sunday services. Approaching one such place of worship, I could hear the sounds of Gospel music filling the street from about a half-block away. When I rode up to that particular small church, I couldn’t help but pause and spend a little time listening to the congregation singing the praise of God to the rhythm of a hard-driving gospel band. It was quite moving. McNichols is closed at City Airport so I took East Outer Drive to 7-Mile and took that to Van Dyke Street. 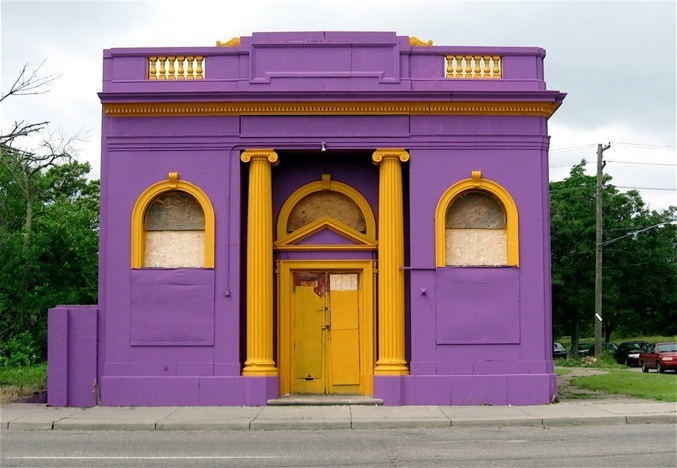 Heading south on Van Dyke to McNichols I noticed a purple building with some unusual, decorative female looking “gargoyles” jutting out near the top. They didn’t appear to be original to the structure and they made me think that perhaps the building was once used as a theater. Note the unusual faces near the top. 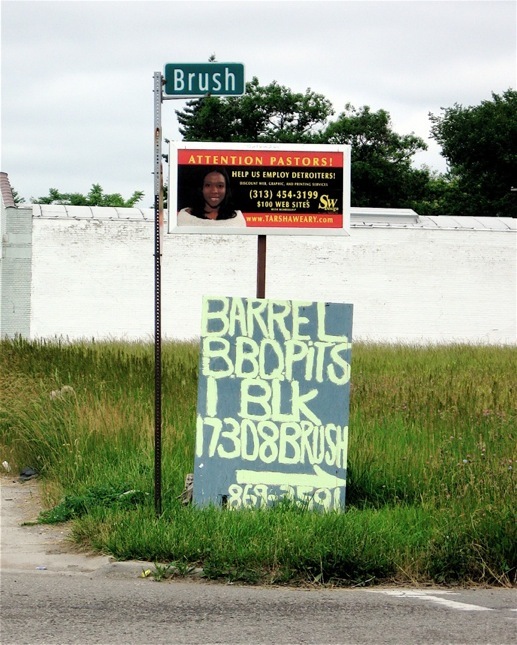 Turning west on McNichols off Van Dyke, the area became noticeably industrialized. Mixed in among viable manufacturing businesses were abandoned, graffiti covered post-industrial structures with weed-choked lots. 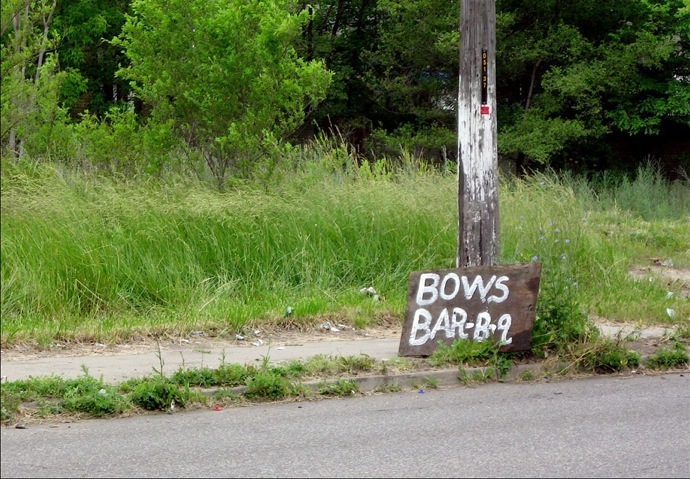 Along the stretch between Van Dyke and Mound Road and a little further beyond, were numerous scrap buying businesses and junkyards. Some were highly organized by particular auto part category and painted in bright, eye-catching colors. Others were basically fenced in lots with random car parts scattered about the oil soaked ground. Pole signs seemed to be everywhere on McNichols. I like the use of caps and small letters. 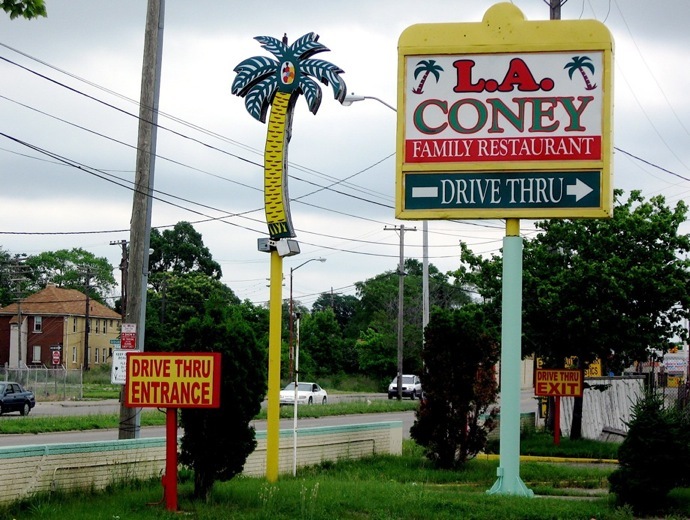 On my two-wheel journey across McNichols, I saw many small places to eat, with most being Coney Island restaurants, a common sight in Detroit. As I rode slowly by one of these hot dog places, I peered in. Looking past the “daily special” poster stuck in the window, I saw bulletproof glass separating the order/seating area and the kitchen area… a customary Detroit restaurant and liquor store fixture. One of many Coney Island restaurants found on McNichols. I passed under I-75 headed to Woodward Avenue. That stretch mirrored most of what I saw up to that point: storefront abandonment, small businesses barely hanging on and various convenient stores that cater to the poverty-stricken community. As I crossed over Woodward, I was reminded of how wide the avenue is through that section of north Detroit. It must be eight lanes wide. However, I’m not sure because I was busy watching traffic as I crossed over, losing track of how many lanes I was crossing. A few blocks past Woodward, McNichols becomes mostly residential. 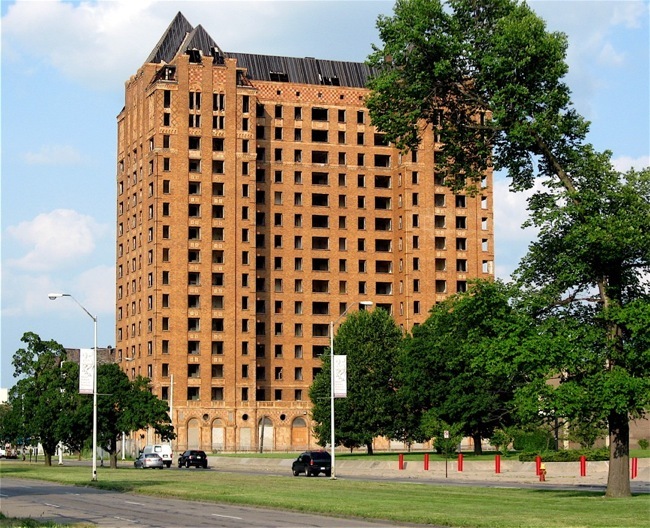 There are beautiful, well-maintained apartment buildings on the south and to the north, sprawling brick homes that abut the Detroit Golf Club. When I reached Linwood Street, I paused to enjoy the peaceful, calm environment of the Detroit Golf Club in the distance. Finally, I turned south on that street for my ride home. 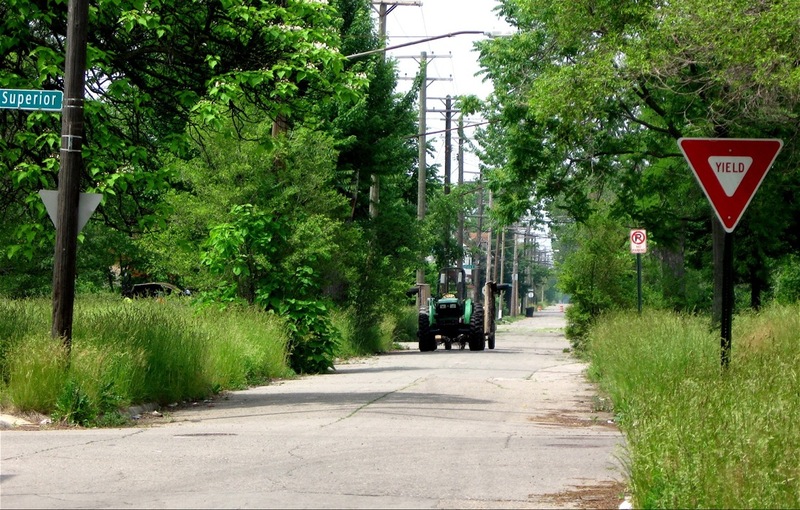 As I wrote in a previous entry, countless neighborhoods in Detroit have turned into fields, with many blocks having no or a few remaining homes. 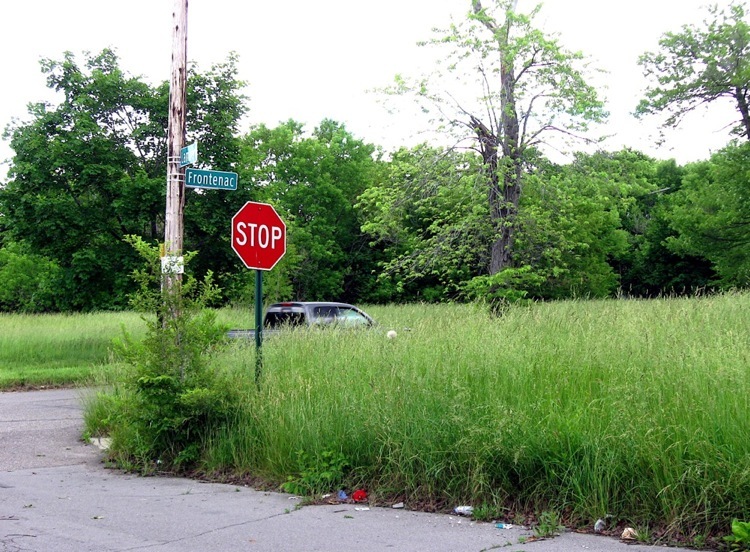 In riding through these once viable neighborhoods over the past month or so, I’ve seen numerous vacant lots that have not been mowed, and they now look like tall-grass prairies. I’ve also watched people as they walk on sidewalks that have basically become paths through pastures of overgrown grass that, in some cases, was at least four feet tall, taller than their waist. At some intersections, I could only see the tops of cars as they passed by. The grass is almost as tall as the passing vehicle. While bicycling up and down these streets, I’ve also come across vacant homes that are now completely surrounded and covered in overgrown grass, bushes and trees. On some streets, blooming rose bushes have gone wild and have crept up telephone poles, across old fences and up the sides of long abandoned homes. I’ve also heard pheasants calling out from the surrounding brush in their unique “scratchy” tone. In a weird kind of way, it is a beautiful, relaxing environment. 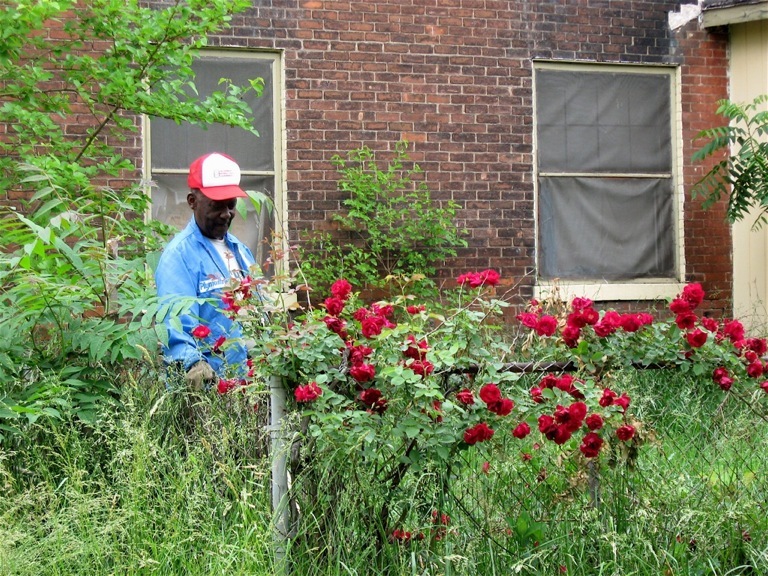 Anthony is harvesting a wild rose-bush for his eastside home of 53-years. 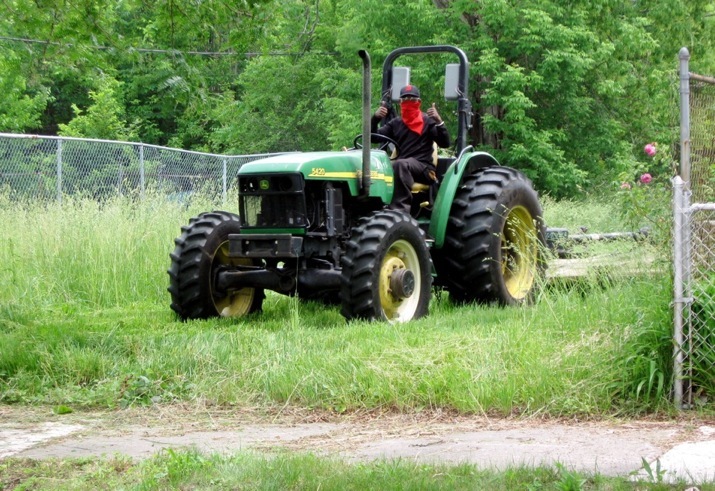 The other day I was cycling through one of the many eastside neighborhoods of fields when I came across tractors moving slowly down the narrow streets with mowers attached. 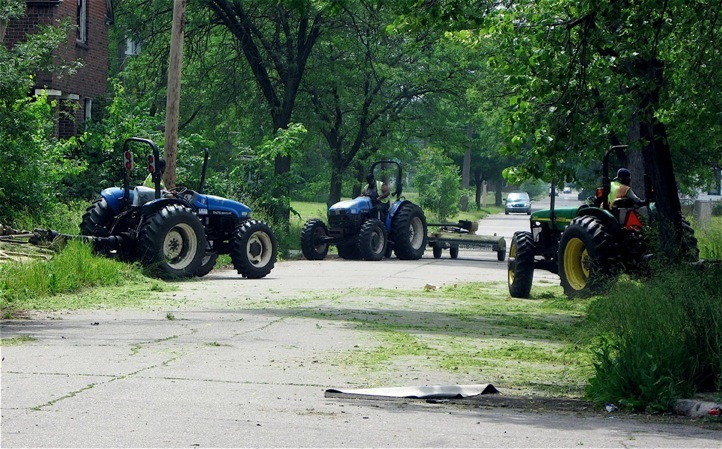 The scene reminded me of a small Nebraska town or a rural section of Michigan’s thumb area where tractors are a common sight. I’m sure they’re not commonly found a few blocks off Gratiot Avenue, a major, heavily traveled road through Detroit. This reminded me of small town America. I decided to pedal up to where they were working, to see first hand what their mission was. It appeared they had targeted a few blocks in the neighborhood for mowing. 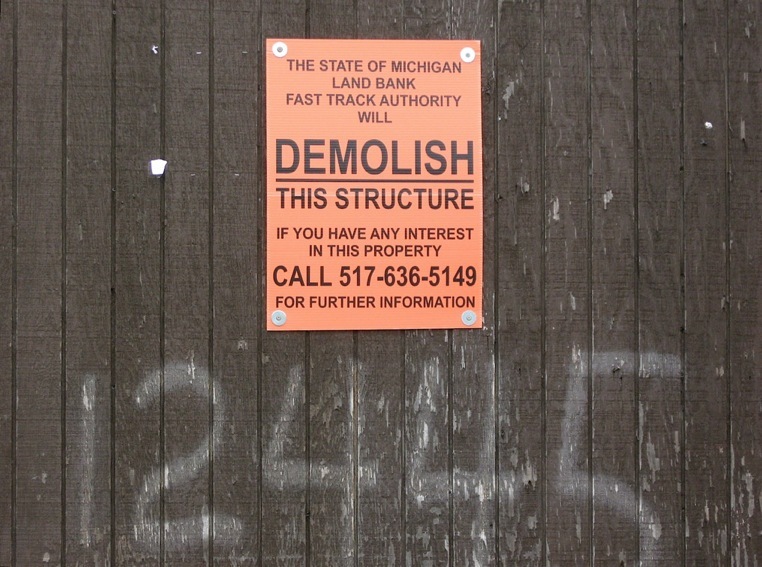 Not only were they cutting the big open, vacant lots, but they were also attacking the smaller lots between the few homes that were found on the streets. In watching them, I was impressed with how the drivers, bandana’s covering their nose and mouth to keep the dust out, handled the tractors and attached mowers. They squeezed them between homes, followed each other a little off-center for cutting large swaths of land and carefully wound their way around telephone poles, fire hydrants, street signs, parked cars and across curbs. This driver had a knack for getting around obstacles. These guys were good. I could tell by the hand waves and thumbs-up they gave me, that they were proud of their work. They should be; it’s a daunting task they’re up against. A tractor on the right is almost lost in the brush. Thumbs up to a job well done! 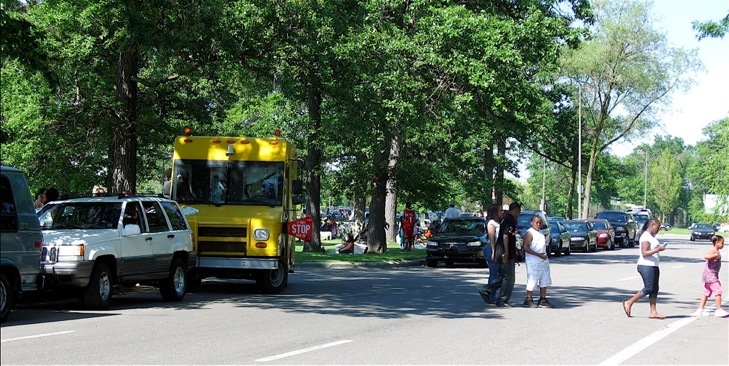 Seeding Growth and Opportunity in Detroit – The 2nd Annual Colin Hubbell Bike Ride will be held Saturday, June 19 to support the Colin Hubbell Fund. The 12.5 mile ride will start and end at the Traffic Jam & Snug restaurant in Detroit near Wayne State University. 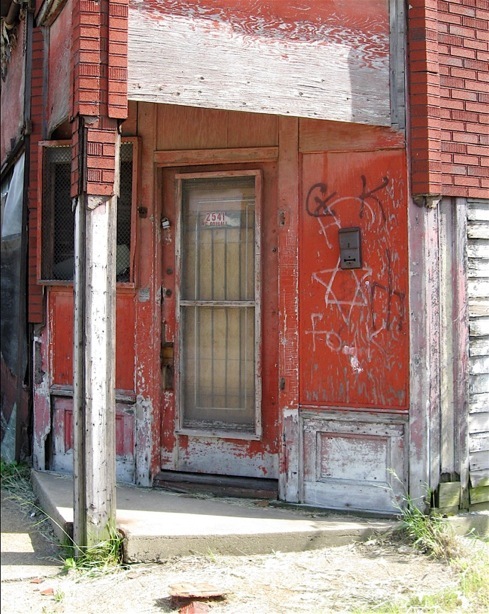 The tour will wind its way through Detroit’s Midtown, Woodbridge, and Corktown neighborhoods as well as Downtown Detroit. Registration begins at 9 a.m., with the ride starting at 10 a.m. Registration fees – Advance – $20 adults, $15 youth. Day of – $25 adults, $20 youth. What a great weekend it was for bicycling in Detroit. Downtown was hopping with cyclists, families and others enjoying the sunshine. The Tigers were in town, the Electronic Music Festival took over Hart Plaza, the RiverWalk was full of walkers, and Belle Isle was jammed with cars, people and smoking barbecues! The streets and roads I traveled leading downtown were virtually car free most of the weekend, perfect for pedaling around. My Memorial Day weekend travels included a trip from Mack Avenue out Conner Street past City Airport where I cut through a few residential streets on my way to Mt. Olivet Cemetery. Pedaling through a well, maintained neighborhood near the airport, I came across a gentleman mowing his lawn. I was about a half-block away when he stopped, shut off the lawnmower, reached into a nearby bucket and pulled out a cold beer. As I approached, he yelled out, “want a cold one?” Holding one up. “Are you sure?” he asked with a smile. “Okay, they’re nice and cold!” He added in a last chance plea. “Thanks anyway,” I said and kept pedaling, knowing it was a little after 10 a.m. I poked around the 7-Mile and Van Dyke area before taking a quick ride through Mt. Olivet on a quest for some family history. The 7-Mile and Van Dyke area was quite lively for a Sunday morning. I assume people were on their way to church or to one of the many area convenience stores to pick up the day’s supply of pre-packaged picnic goodies. Mt. Olivet Cemetery was active. Families were there trimming around headstones and placing American flags on grave markers in preparation, I presume, of Memorial Day services. After biking through the place at a leisurely pace and unable to find what I was looking for, I left the cemetery and headed south on Van Dyke. At Gratiot, I took a right and continued downtown. I took a quick detour through Eastern Market and although it was Sunday, a few vendors were hawking their goods. Seeing them reminded me that I needed a flat or two of annuals. 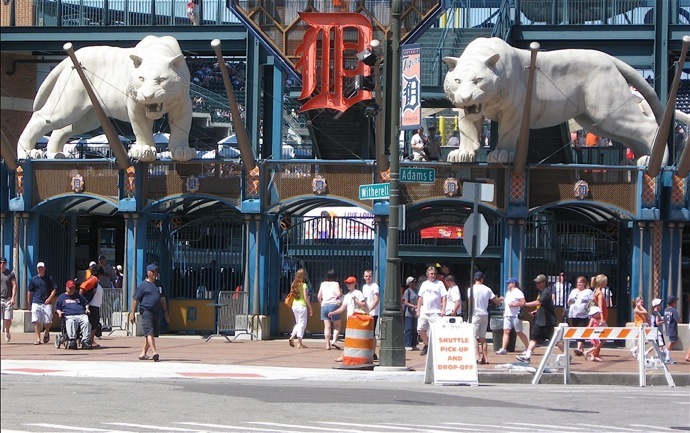 I did a loop around Comerica Park, and by the roar of the crowd I could easily tell the Tigers were having a good day. As I rode past Music Hall, steam was blowing everywhere from the parking lot next door and water was running down the street. In talking with a street vendor, he said a water main had just burst on Madison Avenue. Cars parked in that nearby lot were completely engulfed in hot steam, surrounded by water. Ugh, I could only imagine what the owners of those vehicles must have thought when they returned to find their cars surrounded by water and steam. EMF attendees on their way to Hart Plaza. From Music Hall, I rode to Hart Plaza, the riverfront and on to Belle Isle. Hart Plaza is the site of the annual Electronic Music Festival held on Memorial weekend and it appeared to be packed. Riding past the Festival site on my way to the RiverWalk, I dodged attendees while hearing the Festival music echoing off the surrounding buildings. The RiverWalk was full of young hipsters on their way to the festival and couples were enjoying a relaxing stroll along the river. 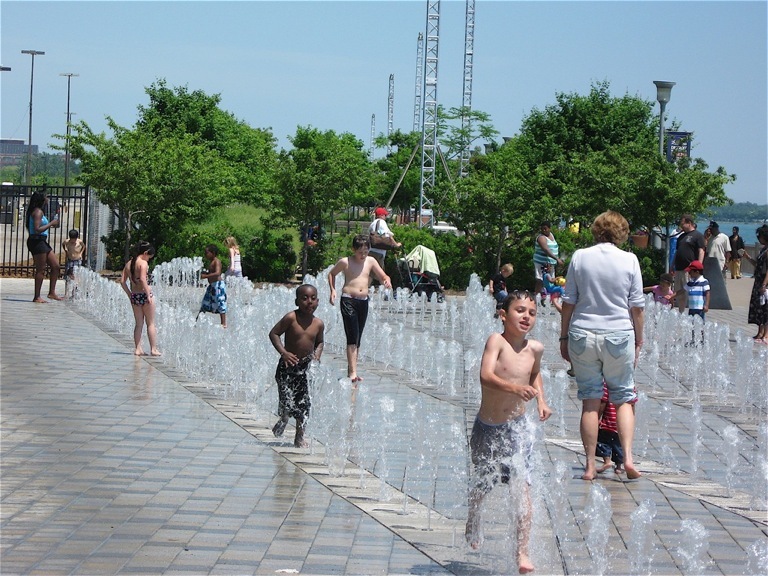 Skaters and bicyclists shared space and families were there snapping pictures as their kids ran screaming through the fountain in front of the Renaissance Center. 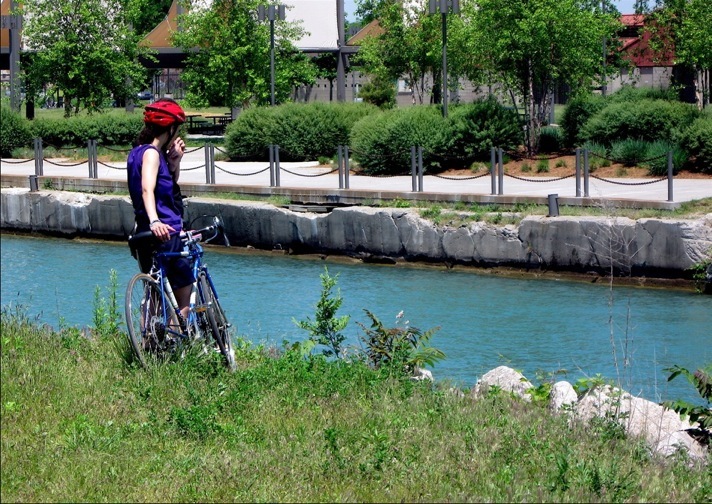 Cyclists enjoying a quiet moment near the river front. 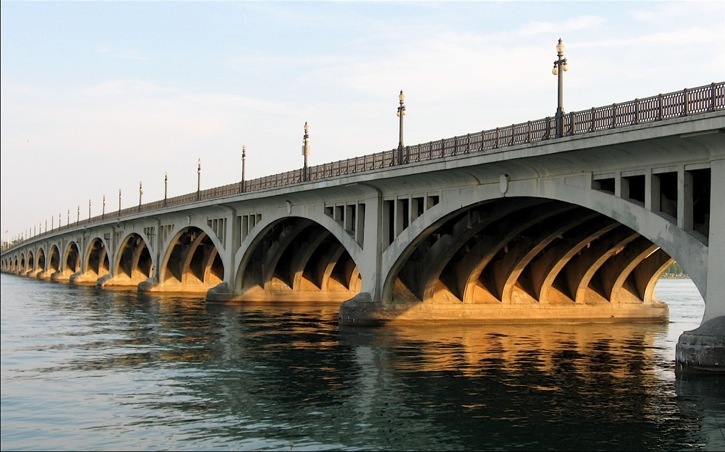 I encountered the heaviest weekend traffic while crossing the Belle Isle Bridge. 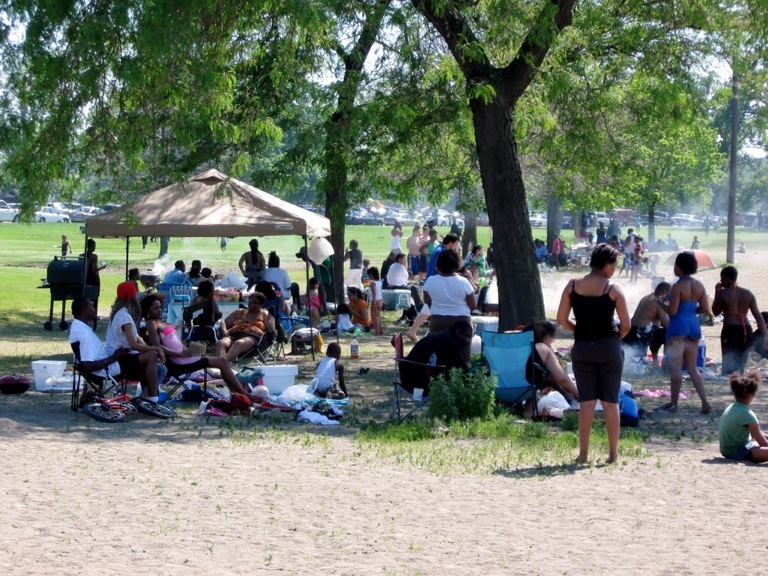 The island was packed with families and others taking advantage of the hot weather. As I pedaled along the south side of the island, near the Detroit River, the rich, tasty smells of barbecued ribs, chicken and other meats filled my nose. There was also a smoky haze in the air coming from the various shapes and sizes of the many grills I saw. A variety of music – hip-hop, Disco, Rock-n-Roll, R & B – some with questionable lyrics, was blasting across the island. Music was coming from inside the many pavilions while other music was being played through PA systems powered by portable generators in many of the picnic areas. Some were so loud that the music was completely distorted. Mixed in were cars crawling along, vibrating from heavy bass lines blasting from their sound systems. With so many sounds, it was hard to tell what was playing at times. Family gathering on Belle Isle. Through it all cruised a lonely ice cream truck playing “Pop Goes the Weasel” with an occasional “Hello, Hello” being shouted out. Kids were lined up buying ice cream.